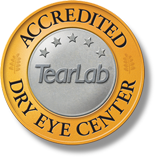 While Groetken Family Eye Care in Le Mars, Iowa has always provided excellent care for those suffering from Dry Eyes Syndrome we took it even further by becoming accredited. Seeking to provide the best care at every turn for your vision. Dr Elizabeth Groetken explains that a disruption of the function of any one or more of these layers can cause dry eye symptoms. Surprisingly, dry eye syndrome can also cause excessive watering eyes due to the tears lacking the proper balance of mucous, water, and oil to coat the eyes properly. Chronic dry eyes can lead to damage of the eye’s surface, an increased risk of eye infections, and eventually, the inability to produce tears. Left untreated, severe forms of dry eyes can even damage your vision. At our Le Mars, Iowa location we can help patients determine potential causes of their dry eye syndrome and identify appropriate dry eyes treatments. Come in or call to find out more.